이것을 통해 딥러닝 추론 가속기의 디자인 표준을 제공하는 목적을 가진다. NVDLA 하드웨어는 다음의 컴포넌트들을 포함하고 있다. 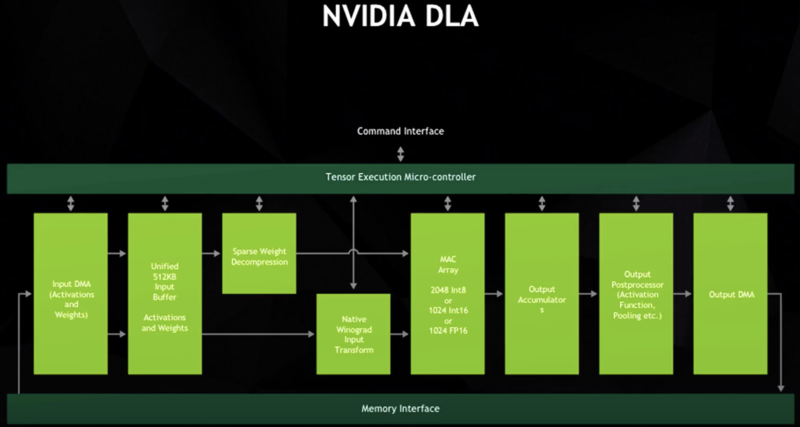 The other accelerators on-die is the deep learning accelerator (DLA) which is actually a physical implementation of the open source Nvidia NVDLA architecture. 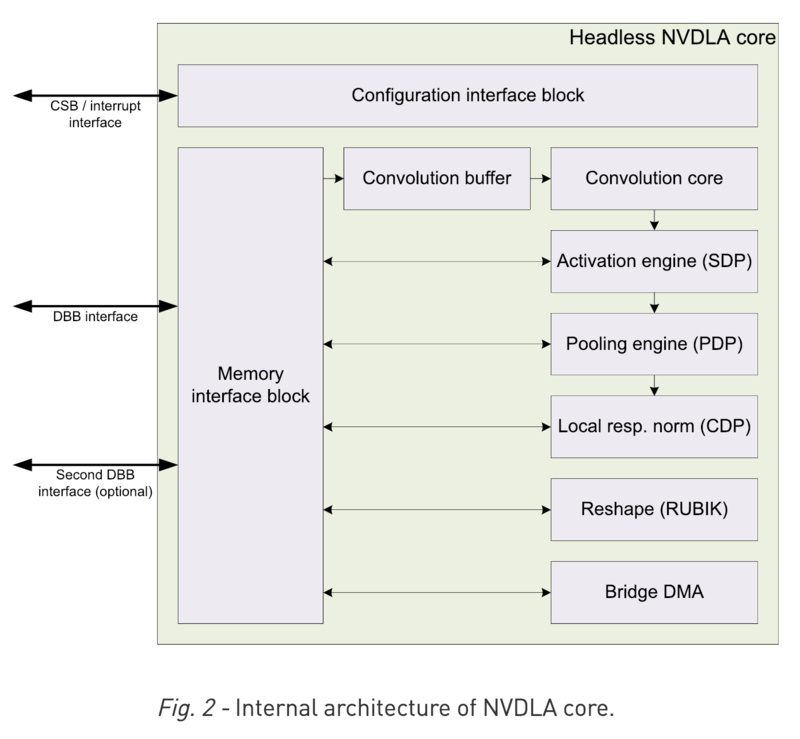 Xavier has two instances of NVDLA which can offer a peak theoretical performance of 5.7 teraFLOPS (half precision FP) or twice the throughput at 11.4 TOPS for int8. 실제 Product로 검증되어서 출시된것이 Jetson Xavier이다. DLA (FP16 at this time)을 지원하며 이것을 TensorRT에서 사용할 수 있도록 지원 한다. WARNING: Default DLA is enabled but layer prob is not running on DLA, falling back to GPU. WARNING: Default DLA is enabled but layer (Unnamed Layer* 9) [Constant] is not running on DLA, falling back to GPU. WARNING: (Unnamed Layer* 10) [ElementWise]: DLA cores do not support SUB ElementWise operation. WARNING: Default DLA is enabled but layer (Unnamed Layer* 10) [ElementWise] is not running on DLA, falling back to GPU. Working with DLA 보면 코드가 있다. 즉 CUDA와 다르게 막 쓸 수는 없고 DLA는 TensorRT를 통해서만 사용할 수 있다. Jetpack에 있는 Doc.을 보고 TensorRT에서 어떻게 NVDLA를 사용할 수 있는지 알 수 있다. Single Data Point Processor: activation function을 위한 방법이다. linear와 non-linear모두를 지원한다. Cross-Channel Data Processor: local normalization을 위한것 같다. 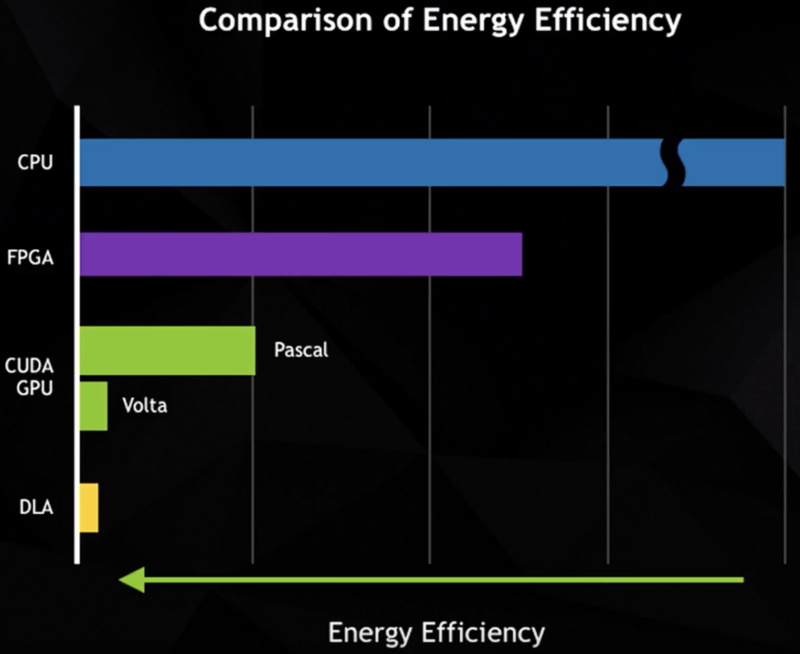 Data Reshape Engines: 텐서 복사나 리쉐입을 위한 memory to meory transformation acceleration. 즉, splitting, slicing, merging, contraction, reshape transpose. Bridge DMA: 시스템 DRAM사이에서의 데이터 전송을 관장한다. Runtime environment: (run-time software to load and execute entworks on NVDLA).